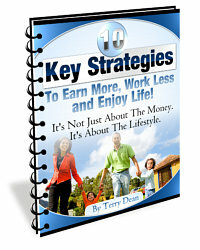 Thank You For Visiting the Terry Dean Internet Business Coaching Blog today. You find numerous articles and posts designed to help you Earn More, Work Less, and Enjoy Life in your business. A large number of my readers run internet based businesses, but there are also a good percentage who own brick-and-mortar businesses who are learning to generate leads on the Internet. Whether you already have your own successful online business, you run a brick-and-mortar business, or you’re a newbie to the Internet world…you can find something here for you. At times I release products to my readers such as my brand new “Choosing Slam Dunk Markets.” One of my coaching clients has entered and profited from 17 radically different markets successfully in the past 2 years. Not just 17 different products….17 different audiences. This means his lists do not crossover in these markets. He quietly enters a market…peeks inside the heads of customers and competitors…and builds an irresistible marketing machine. He did a 65 minute interview with me where he shared his system of finding profitable markets, examining from the inside out, and then making sure he was going to be successful before he ever entered the market. The cost – Only $47 for the complete audio, transcript, and step-by-step flowchart. Of course, these products don’t mean that I’m not continually providing you with free content as well. Normally I post around 3 times per week about how to boost your profits, decrease your expenses, and have fun while doing it. What most subscribers tell me they enjoy the most is the hype free marketing advice combined with step-by-step action plans and business guides. – Will You Take Action?